Capitalism is always developing, but in Finland it is undergoing a complete transformation. Our actions are changing the way the economy operates. The world can learn from Finland’s experiments and actions in a more advanced version of capitalism: the circular economy. Reformers of the world economy! Do you remember the little country in northern Europe that educates top-level experts although pupils have time to play at school and get free meals provided by society? The country whose name was overshadowed by the name of the mobile phone giant Nokia it created? The country that is currently trialling basic income, a model in which citizens are paid the same amount of money regardless of whether they work or not? Finland now has an offer that is impossible to turn down! The size of the world economy is currently about 80,000 billion dollars, whereas it was only about half of this at the turn of the 21st century. Wealth is increasing – according to the Forbes list the number of billionaires has multiplied in a few decades. This is good news – or is it? A glance at the economic and political news reveals that Western countries are struggling with unemployment and people’s dissatisfaction as capital flees and accumulates to very few people. Indeed, the Forbes list reveals a great deal about humanity’s operating practices: the names topping the list of the world’s richest people include people who have created their fortune in a very traditional way, by selling as many goods as possible. Wealth largely continues to be based on using natural resources, making short-lived or even disposable products and selling as many of them as possible. Here in Finland, we have decided to strive for prosperity in new ways. We are now building a circular economy – a new economic model in which consumption is based on using services – sharing, renting and recycling – instead of owning things. Finland was among the first countries to move towards an era in which well-being in society doesn’t depend upon the increased mass production of more and more goods. The small nation from the Arctic is offering an attractive alternative to the reformers of the world economy – a circular economy that allows an increasing number of people to be among the winners and enables us to give up the overconsumption of the Earth’s natural resources. We therefore dare to say that the Forbes list will look rather different in the future: the winners will be those who can repeatedly make money with the material already in circulation without touching unused natural resources. The triumph of the pioneers of the sharing economy, industrial symbioses and the bioeconomy is waiting to happen! Have you regarded the circular economy as just a funny word that keeps popping up, perhaps when you hear researchers or politicians talk? It is sometimes disguised as a related term, such as the sharing economy, industrial ecology or the cradle-to-cradle model. Science communities across the world have been developing the terms for years, business models referring to a circular economy have been seen on slides in business schools and even individual examples of businesses have been created here and there. Still, few places have promoted practical activities according to the principles of the circular economy widely in the whole society. However, Finland started some serious work on this funny word a few years ago. The intention has been to experiment with what a circular economy would mean in practice. According to our estimates, the circular economy may bring an annual added value of at least three billion euros to our national economy by 2030. It is a good addition to the amount that currently totals slightly over 210 billion euros. It is worth noting that a circular economy requires cooperation and that different sectors often need to be brought together. A nation of 5.5 million people lends itself well to experiments when almost everyone knows each other and different partners are often near. In addition, Sitra, the future-oriented organisation of the Finnish people, already had experience in spreading understanding about the sharing economy (link in Finnish only), developing guidance on energy efficiency, regional experimentations aimed at resource wisdom and extensive creation of industrial symbioses. These were all refined into an approach for the circular economy. Many operating practices aimed at a more sustainable economy can often be combined with the circular economy. The efforts of the Finnish Government, headed by the Centre Party, to increase the bioeconomy and clean solutions have fitted perfectly under the umbrella of the circular economy, as have the blue bioeconomy related to the use of waterways and the already mentioned sharing economy and industrial symbioses – to mention just a few examples. Recently, the carbon cycle has also been discussed with regard to the circular economy. Hard work has been required to encourage the different actors in society to participate in implementing the biggest transformation in our economy since the development of monetary economics. It is the work we have carried out here at Sitra – as an independent, self-financed future-oriented organisation operating directly under the Finnish Parliament – bringing together people from the administration, businesses, research and the third sector (for instance NGOs). As a think tank and workshop for experimentation, we have not only anticipated the direction of developments in society but also worked hands-on to enable Finland to take its first concrete steps towards a circular economy. We have been able to enjoy new insights and ambitious projects, like a company selling lighting as a service or a plan to create the most sustainable food system in the world (link in Finnish only). Reformers of the economy! We Finns now make an improved version of the market economy available to you! You can take advantage of our experiences in creating the world’s first national road map to a circular economy and the practical circular economy projects it has helped initiate. 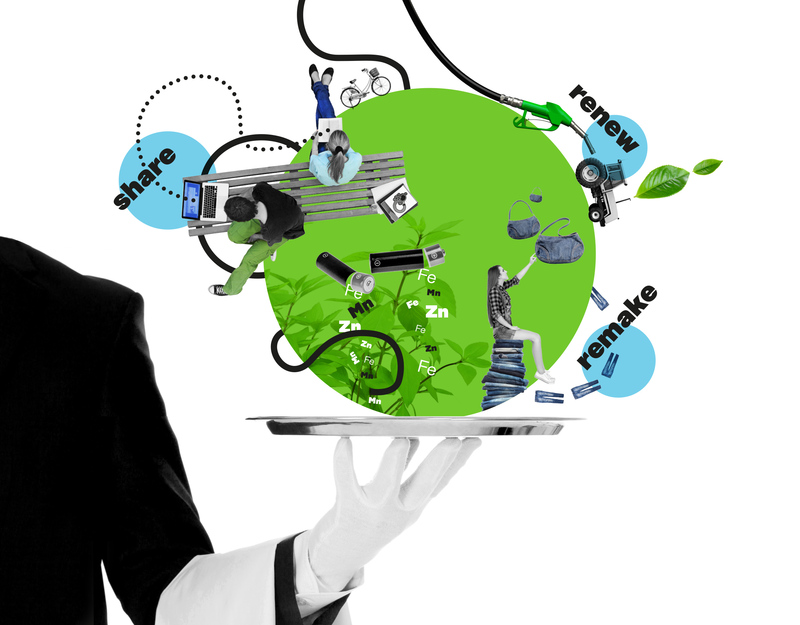 Let dozens of Finnish business examples in the circular economy inspire you! You can also take your pick of the lessons we have learned about organising more sustainable sports competitions and about applying the principle of the circular economy to making scout scarves. We can also reassure you that ecosystems of heavy industry do develop, as one such system works even in the arctic conditions of the Arctic Circle! In the spirit of the circular economy, we will put the best knowledge into circulation in June 2017 when we convene 1,500 global circular economy pioneers and experts in Helsinki at the first World Circular Economy Forum. The best circular economy solutions from around the world will be on show. Pick your best solutions and build an economy that takes into consideration the limits of the Earth!